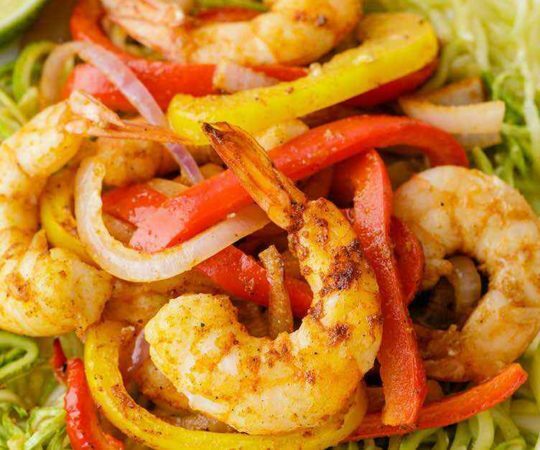 Do you remember the first time you had shrimp? I do. 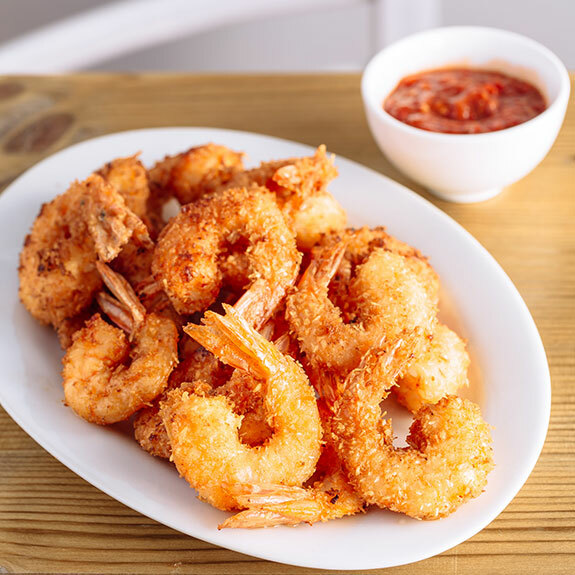 I was probably 10 or 11 – I grew up in the Midwest so seafood wasn’t everywhere like it is on the coasts – and it was at some cheesy buffet-style restaurant and it was some big old breaded and deep fried shrimp. I loved it! Now I have a way to enjoy crispy fried shrimp without all the bad stuff with this Paleo coconut shrimp. As I became a teenager, I gave up fried shrimp because I thought the fact that they were fried would make me fat. But now that I’m a die-hard Paleo eater, it’s the wheat flour-based breading that I eschew. 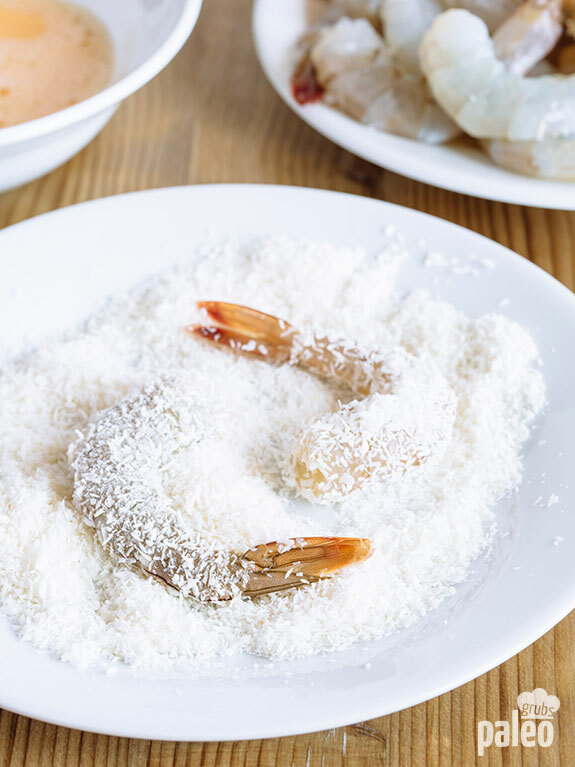 This recipe for coconut shrimp is great because the coating on the shrimp isn’t wheat flour – it’s shredded coconut. I get all the crispy texture and rich flavor of traditional fried shrimp, with none of the grains. 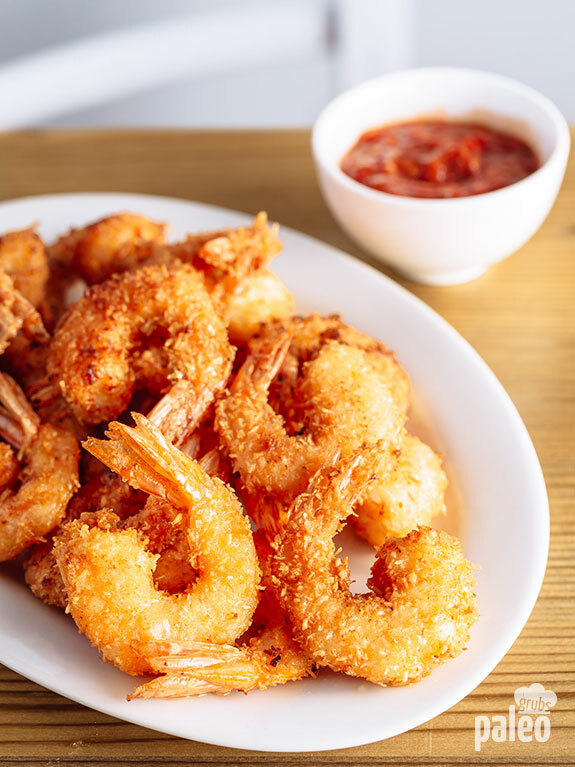 You can often find coconut shrimp at Asian or Caribbean-style restaurants, but be careful because sometimes their batter is a mix of wheat flour and coconut. And stay away from that weird red-orange sticky sauce they serve with them. Who knows what’s in that! Finding a restaurant that makes these with just coconut is great – but of course my favorite is making them myself. 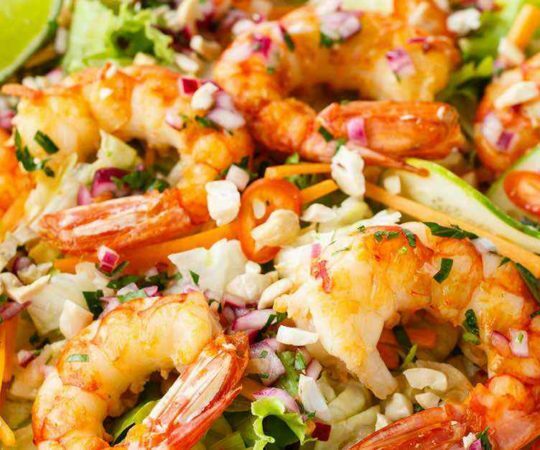 Shrimp are basically little packets of pure protein. They are a great base for a meal. 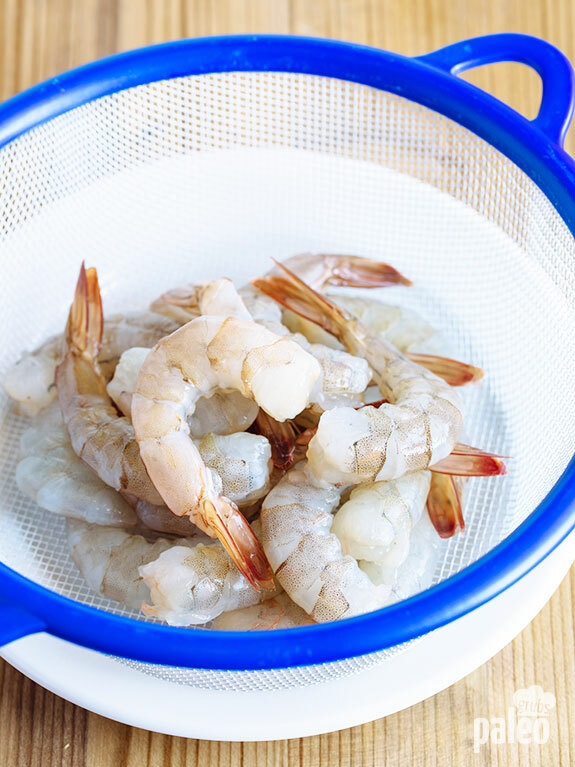 If you get your shrimp fresh, make sure you devein them or ask your butcher or fishmonger if he or she can devein them for you, if they don’t already come that way. 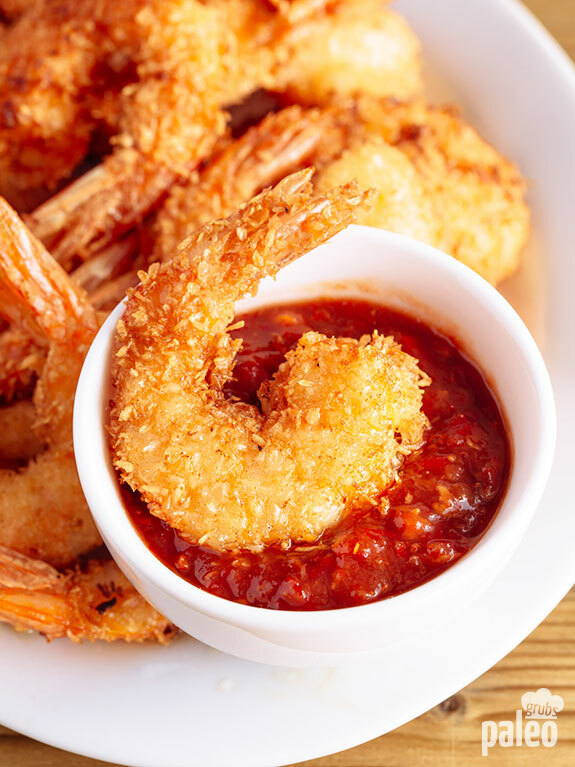 Deveining is not the easiest task, but you definitely want to do it because nothing ruins the perfect bite of a coconut shrimp than biting into a gritty vein. Ick! But if you do have to devein them yourself, get a really sharp knife and run it down the back of the shrimp, over the dark colored “vein”. You can usually then scrape out an edge of the “vein” with the tip of the knife and then gently pull it out like you’d pull a string. After getting it out, I toss my shrimp into a bath of cool water to get any remaining grime off of them before I start the cooking process. At most restaurants that serve coconut shrimp, you would traditionally get a bowl of rice with them. 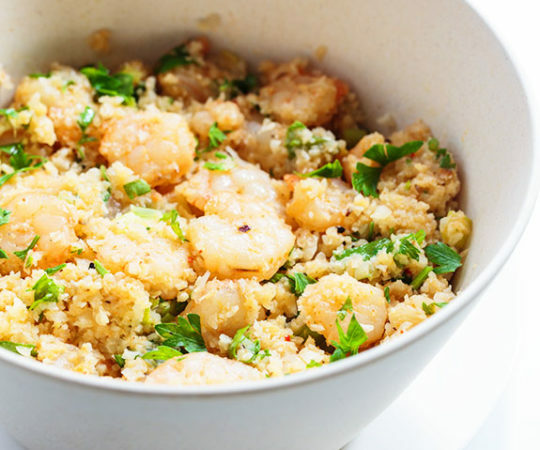 So, when you’re serving up coconut shrimp at home, why not try out some cauliflower rice as a side dish? That will make a full meal of it. Of course, when I’m cooking just for myself, I often skip the side dish and just nosh on a big plate of coconut shrimp. And they’re also great as an appetizer for either sit-down meals or cocktail parties. 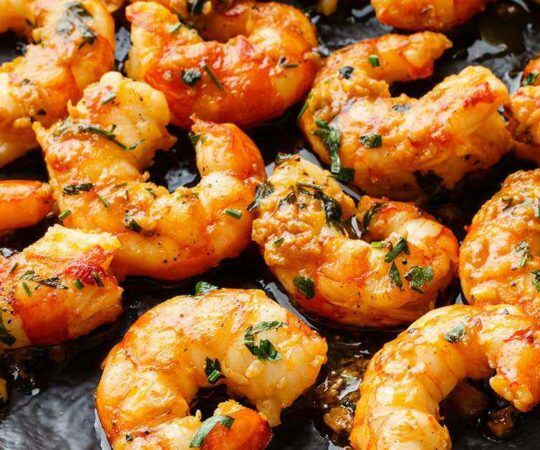 Especially if the shrimp come deveined, they are super quick and easy to make, too. Even though I’ve been eating Paleo for a while now, these coconut shrimp still feel like a treat to me. Fried shrimp! I feel like I’m splurging! But I’m really not. 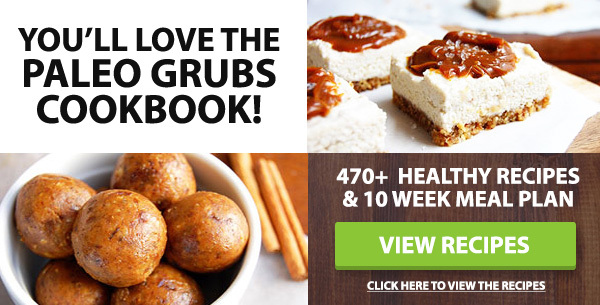 These are perfectly Paleo bites of goodness with a hint of sweetness and of course the great crunch from the fried coconut. To enhance the sweetness, I love a little drizzle of honey over these bad boys. You can’t beat the flavor. Another Paleo win! In a shallow bowl, beat the eggs with salt and black pepper and set aside. Place the shredded coconut in a plate. Dip each shrimp in the eggs then press in the shredded coconut. Pour the coconut oil to depth of 1/2 inch in a large skillet and heat it over medium-high heat. 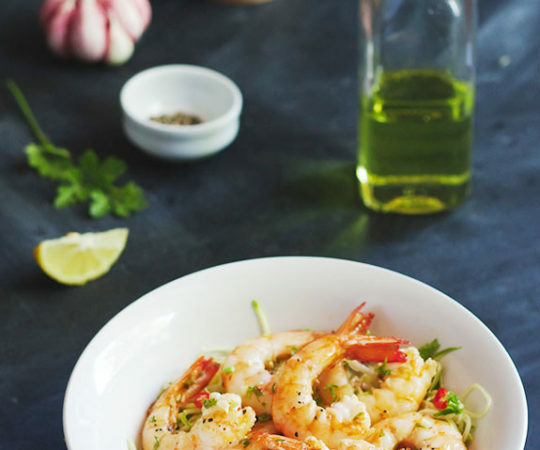 Fry the shrimps in batches until golden brown, about 3-4 minutes per batch. 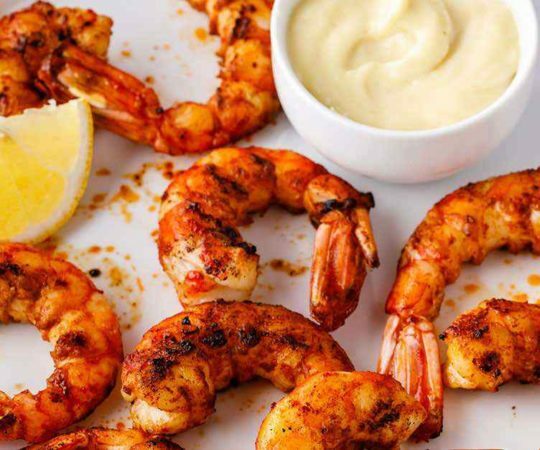 I’m new to Paleo, any recipe suggestions on good sauce to dip the shrimp? Hi Melissa maybe a mango and chilli salsa? Hilary Wendel.. That sounds delish! !